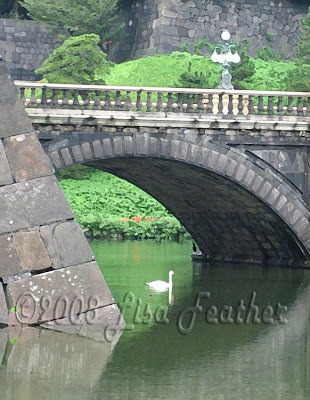 This is a scene from the plaza near the Imperial Palace in Tokyo. The bridge is called the Meganebashi because it resembles eyeglasses as it reflects in the water. The day I visited I captured this image with a swan swimming in one of the lenses. This image captures a tranquil scene in the middle of Japan's bustling capital city. The stones offer a solid permanence and their texture beautifully offsets the lush green of the Japanese landscape and the dreamlike reflections in the jade green water.